Download the hour-long program or read the transcript. 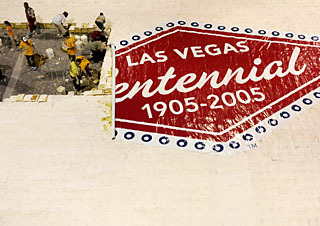 A group of volunteers put the final touches on a giant cake to celebrate the centennial of Las Vegas. Las Vegas marked its centennial in May 2005. The city celebrated with a 65-ton cake. Delivered on seven flatbed trucks, assembled in an airplane hanger, and iced by a legion of volunteers, this was a fitting confection for a city that relishes spectacle and glitz. At age 100, Las Vegas had many reasons to celebrate. Once a remote desert outpost, Las Vegas is the fastest growing metropolitan area in the United States. With dozens of flourishing hotels, casinos and restaurants, tourism is at an all-time high. It's a place where tens of thousand of jobs are created each year, 60 new streets are named each month, and more than 1,000 new residents move to town each week. In a city famous not only for spectacle, but sin, Las Vegas also has its share of trouble. Las Vegas ranks near the top of American cities in rates of alcoholism, drug addiction, personal bankruptcy, teen pregnancy, and suicide. Despite these problems, journalist Marc Cooper says people are beating a path to Vegas in search of a better life. "I think in many ways, Las Vegas is the most American of cities, and it's a real irony," says Cooper. "People used to come to Las Vegas to get away from America. … And all those jobs and all those careers that people thought were safe and secure in the heartland of the rust belts etcetera have disappeared. … So, history has had a good laugh because Las Vegas turns out to be one of the best places to come to work, and to get a career, and to get a union job and to get a living wage … so you actually come to Las Vegas the way you used to come to Detroit."